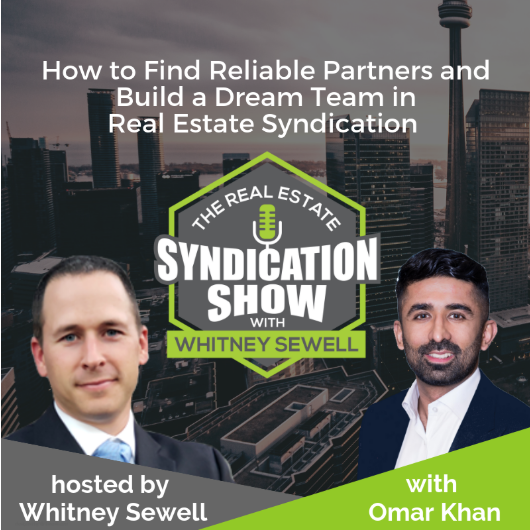 In this episode, Whitney interviews Omar Khan, CFA and M & A expert with Boardwalk Wealth. Omar gives some great insights that will help syndicators find reliable partners with complimentary skillsets. How do you vet property managers and brokers? Would HNI’s will be willing to act as key principals on a syndicated deal? We also share how even inexperienced syndicators can find buy in with property managers and brokers. Tune in to get some great nuggets from this gentlemen who has the rare distinction of advising capital financing and M&A transactions to the tune of $3.7 billion.